In the US we are posturing to elect our first woman President. Many US citizens will vote for Hillary Rodham Clinton on the sole basis that she is a woman. I’m not sure that’s wise, but it is a statement that more people want to see women in power. Personally, I don’t think she is the right woman for the job, but someday I am looking forward to a woman heading up the most powerful nation in the world. At any rate, Clinton has broken the glass ceiling by getting her Party’s nomination and the recognition that as women, we have come a long way, baby. The Dalai Lama travels the globe and sees first-hand the repression and injustices women face every day. Perhaps he views the western woman as having more privilege and therefore more influence? If that is the case, then privilege is just one cornerstone that holds up a towering prophecy. As we have witnessed over the past year specifically, a woman can have connections and influence, but if they are not used for the good of all, then they are really no good at all! Being in a position of power makes a person desirable to everyone who wants a piece of the power. It’s sad, but a known fact that influence can be bought. Without integrity, a person in an influential position will hand out favors to whoever levies the highest bid. Integrity must be maintained for the overall good and long term well-being of any endeavor involving the whole. Women certainly do not have a stronghold on integrity by any means as history has given us many good men and women alike. 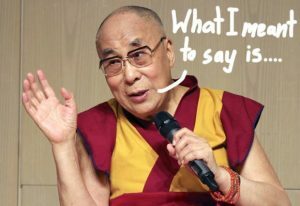 So why does the Dalai Lama – whose words are meaningful, think that the western woman has a step up to making a difference that matters? It’s merely conjecture but, consider that as women we are the receptacles of life for 9 months before a human being enters the realms of good and bad. Does that experience in and of itself promote more compassion and even innate affection towards one of our own? I know many will corner me on spouting a feminist viewpoint, but it is a fact that women carry life in a way that men simply can’t. Again, speaking with a view from a wide angle lens, does the western woman have more respect for the circumstances of other women, other people as a whole? Western women often have the advantage of time. While there are millions living in survival throughout the world who don’t have the luxury of time to make a difference, that is not predominantly the case in the western world. Western women see a problem and they take the time to advocate change. With the advantages of education, the time is spent infiltrating the challenges and figuring ways to overcome them. Yes, this article is written in general terms, and not expounding on the good deeds of organizations from the world over. The bottom line from this writer’s point of view . . . We all need to work in unity if we are to “save the world”. Leave a comment below with your take on what the Dalai Lama’s statement was meant to convey.